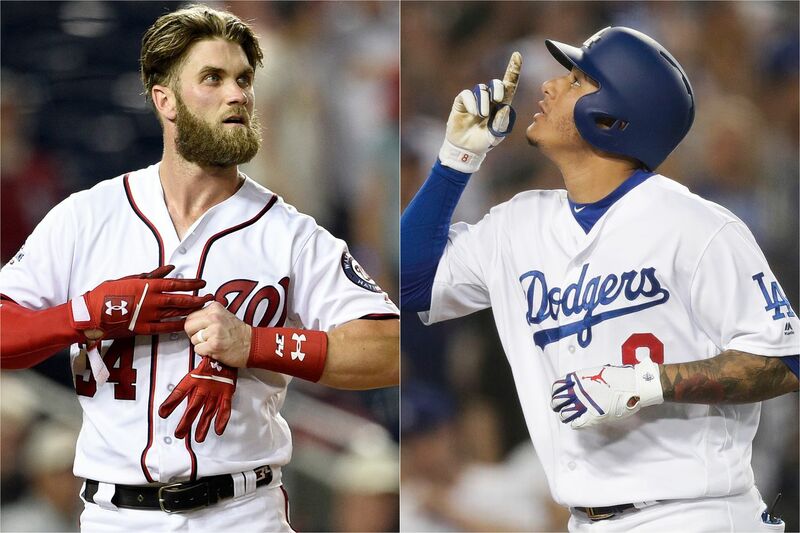 Bryce Harper (left) and Manny Machado — the prized players on the free-agent market. Well, that was interesting. Phillies president Andy MacPhail held a 35-minute news conference Tuesday afternoon that featured enough honesty, criticism, and revelation to hold your attention. MacPhail said manager Gabe Kapler was a bit too positive, criticized the inconsistencies of several players, and not only said the Phillies will be active in free agency but also seemed to make it pretty clear that the Phillies will make a few trades this winter. The offseason is ready to begin. Rhys Hoskins (left) and Bryce Harper chat during a replay in a game vs. the Nationals on Sept. 11. Yes, the Phillies will be aggressive this winter. Yes, they have a ton of money to spend. And yes, they will make a heavy push for both Bryce Harper and Manny Machado. But could they actually sign both superstars? "There has been some speculation about what we're going to do, which I find to be just someone just didn't put a paper and pencil together and do the math," Phillies president Andy MacPhail said, an apparent reference to national reports earlier this summer that the Phillies would try to sign both players. Signing both always seemed far-fetched, but now it seems out of the question. MacPhail, just as Matt Klentak did last week, seemed to temper expectations this winter by bringing up the strength of the free-agent classes in the next two seasons. But make no mistake: MacPhail and Klentak are just simply tempering expectations. The Phillies have no plans to punt on Bryce Harper and Manny Machado. As much as you may want them to say that they're star-hunting, is there really a benefit to saying it? Then what happens if they whiff like the Sixers did this summer? MacPhail and Klentak might not be making any bold proclamations, but the Phillies' star-hunting mission is ready to begin. Just don't count on it bringing in the two biggest stars as a package deal. "I would anticipate that we're always going to be active," MacPhail said. "This ownership group has demonstrated that it's not afraid to have a payroll in the top five. It's our hope to get back there." Like you, MacPhail is also stumped by the inconsistent play this season from the Phillies, Scott Lauber writes. MacPhail said the Phillies were the most inconsistent team he's been associated with and the team's inconsistency — a good month paired with a bad month — will make trading players difficult because you're unsure of their true potential. The offseason is ready to begin and Bob Brookover writes that the Phillies have to make a push for a superstar free agent: "If the Phillies have not signed a superstar player and upgraded their pitching staff by the end of this offseason, it is hard to imagine them being significantly happier at the start of next season." Do you think Kapler is just a bit too positive? So does MacPhail, who said he's going to take the Phillies manager out for a two-hour dinner and tell him, "You have to find a way to craft a message that is not critical of your players or negative but acknowledge that there's some areas, like the rest of us, we need to make some improvement." Tonight: Athletics at Yankees in AL wild card game, 8:08 p.m. Tomorrow: Rockies at Brewers in NLDS, 5:07 p.m.
Also tomorrow: Braves at Dodgers in NLDS, 8:37 p.m.
Friday afternoon: Indians at Astros in ALDS, 2:05 p.m.
Friday night: A's/Yankees at Red Sox in ALDS, 7:32 p.m. There is no guarantee that Manny Machado will leave Los Angeles this winter. The Phillies had the fourth-most productive free-agent class this season based on Wins Above Replacement, after they spent nearly $170 million on Carlos Santana, Jake Arrieta, Pat Neshek, and Tommy Hunter. The four players combined for a 7.1 WAR, according to Baseball Reference. But the Phillies also spent the second-most money last offseason. The Brewers spent $64 million less and had a much more productive winter than the Phillies. "Not exactly a great efficient use of your dough," MacPhail said. Answer: Thanks, John. I think the correct answer to the Harper-Machado conundrum is just either or. Both are elite hitters and both would immediately launch the Phillies back to the forefront of the city's sports landscape. But that answer is too easy. So, I'll say Harper. He's already familiar with NL East pitchers, loves hitting in Citizens Bank Park, and would allow the Phillies to return Rhys Hoskins to first base. I also wouldn't allow the Nationals' playoff failures to stop me from adding Harper. It's hard to pin the blame solely on him for what has happened in D.C. I don't think simply adding Harper or Machado would be enough to put the Phillies over the top, but it would be a step in the right direction. The Phillies showed this season that they are more than just one hitter away from being a contender. This isn't basketball, where LeBron James is enough to automatically send you to the NBA Finals. The Phillies will still need consistent starting pitching besides Aaron Nola and a lineup that can hit for power around Harper or Machado. But adding one of the two would be a good first step toward contention.